This page aims to serve as supporting information for a recently published novel polynomial decomposition method. We hope this will provide Ophthalmologists with a new basis for more accurate interpretation of the ocular wavefront. In this resource page, you will gain deeper insight into why Zernike Polynomials are currently NOT delivering what they promised. – Fail to accurately define the effect of Higher Order Aberrations on the retinal image quality. 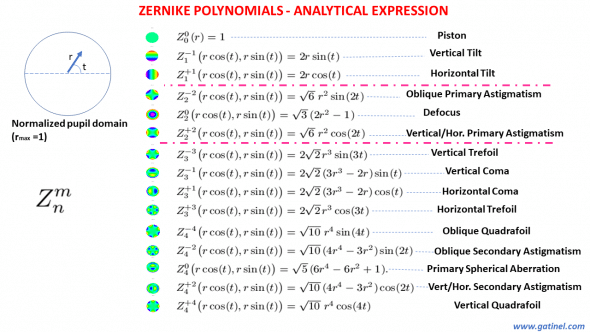 The purpose of this page is to explain why and how Zernike polynomials aren’t quite accurate enough and to provide a solution within a new aberration basis that is better suited to describing an ocular wavefront. 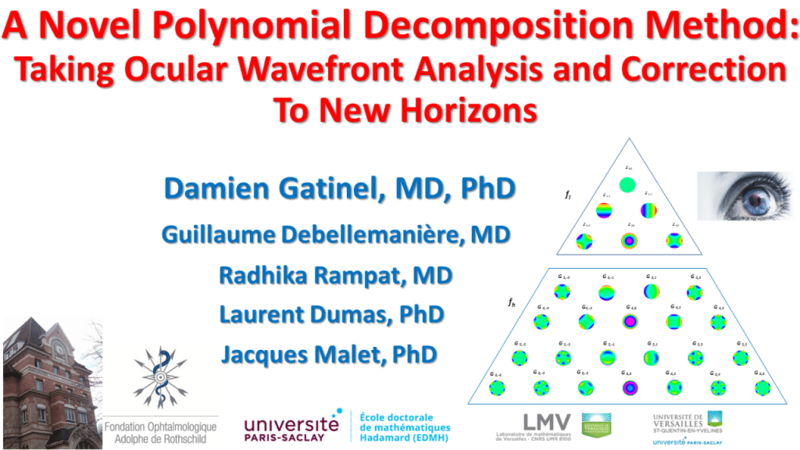 I wish to thank the co-authors who have contributed to this work: Guillaume Debellemanière (MD), Radhika Rampat (MD), and my PhD directors: Laurent Dumas (PhD), and Jacques Malet (PhD). I also wish to thank the Nidek company and its RnD team to have implemented this new method in a beta-software now able to prcess wavefront data obtained with my OPD-Scan III wavefront sensor. Wavefront sensing has enabled clinicians to qualify and quantify the residual wavefront error that persists after best spectacle correction. What was labeled in the past as the umbrella term “irregular astigmatism” can nowadays be qualitatively and quantitatively described using a specific aberration basis which contains the “higher-order aberrations”. To aid in the interpretation of wavefront error measurements, it is convenient to express wavefront data in a polynomial form. Each polynomial describes a mathematical wavefront shape, and the associated coefficient gives the weight of that aberration in the total wavefront map. The output of a typical wavefront analysis is a list of coefficients, each weighing a specific aberration mode. It is expected that the taxonomy of the higher order aberrations is clinically relevant and equipped with interesting mathematical properties. We owe much of our current understanding of the optical aberrations of the human eye to Zernike and famous visual scientists who consensually adopted Zernike polynomials to aid in the standardized interpretation of ocular wavefront data whenever it is convenient to express it in polynomial form. This paper has been published in the Journal of Refractive Surgery in 2002. 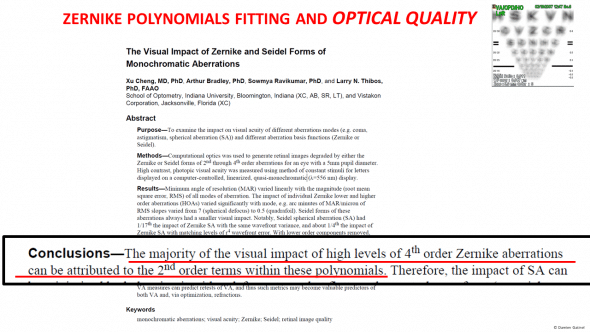 Zernike polynomials are made up of modes that are of the same form as the types of aberrations often observed in human eye optical wavefront analysis. 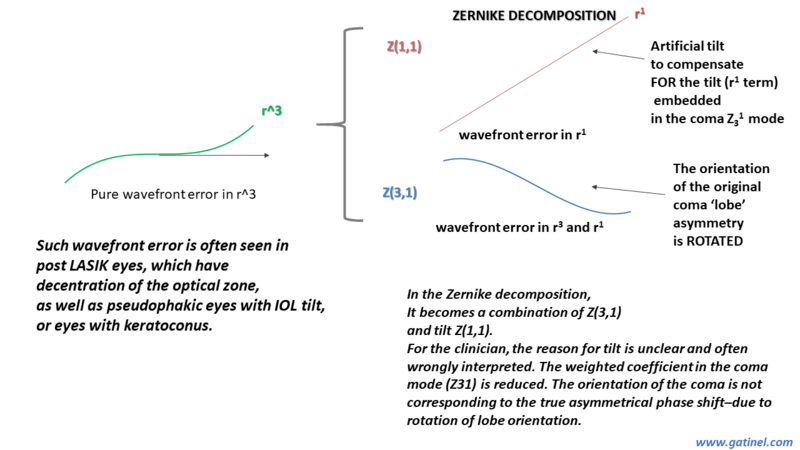 A wavefront error can be decomposed as a sum of weighted Zernike modes. Each weight, or coefficient, is usually denoted z(n,m). This allows quantifying the contribution of a group of weighted modes by taking the square root of the sum of all the squared considered coefficients. 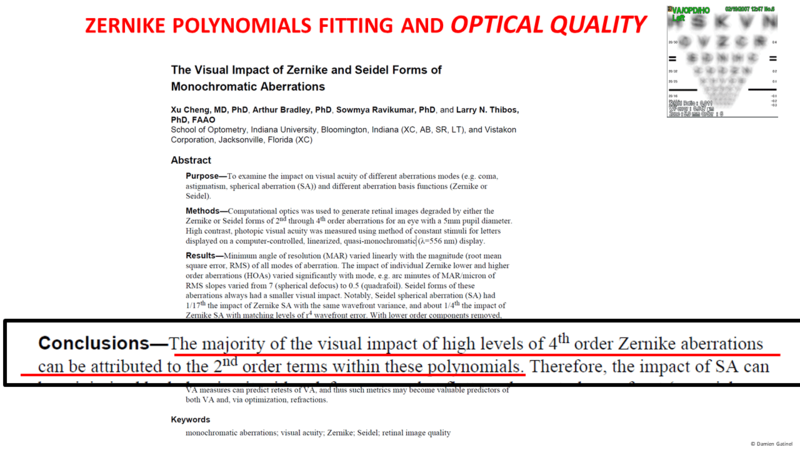 Zernike polynomials have one major drawback for describing the ocular wavefront in an ophthalmic context: these polynomials don’t accurately distinguish between Lower and Higher Order Aberrations. In essence, lower order terms are present within the expression of some Higher Order coefficients so we can’t accurately predict sphero-cylindrical refraction or accurately define the effects Higher Order Aberrations on the retinal image viewed. It is important to understand the mathematical structure of the Zernike polynomials if you want to understand the clinical relevance of these stated issues. Zernike polynomials are not exactly true polynomials in the strict mathematical sense, but the product between a normalization factor, a polynomial of a certain degree (n), and a trigonometric function (sine or cosine) of a certain azimuthal or angular frequency (m). 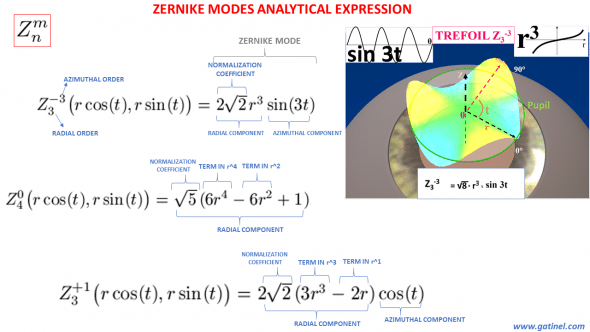 Analytical expression of the Zernike modes. n corresponds to the highest value of the exponent within the polynomial (which we will define as the “radial” part of the Zernike polynomial). They are defined in a double index scheme Z(n,m) (see: Zernike polynomials). For any mode, m cannot be larger than n. If n is odd, then m is odd, and if n is even then m is even. The normalization coefficient ensures that each mode is normalized. The radial order of a Zernike mode is the « HIGHEST » order but not the only one which may be contained within that mode. One mode of order n may contain lower order terms eg r^(n-2), r^(n-4). Zernike spherical aberration (Z40) contains a lower order term in r^2, which corresponds to a defocus phase error. 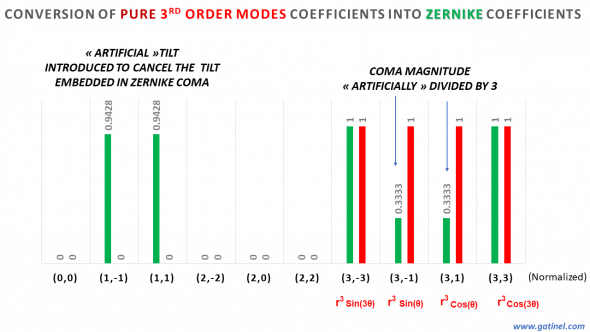 The Zernike coma mode contains a lower order term in r^1. Conversely, some other modes like trefoil or quadrafoil (all the mode located on the edge of the pyramid) are « pure » in their maximal radial order (ex: r^3 for trefoil). 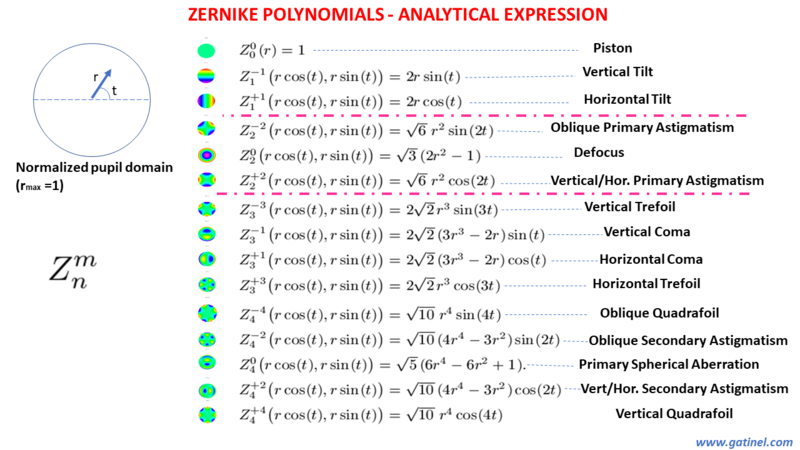 This table represents the analytical expression of the first Zernike polynomials (up to the 4th order). The radial function may comprise of one term (eg: Z1+/-1 with a unique term in r^1), or of several terms (eg: Z40 with a term in r^4, a term in r^2, and a constant term in r^0). The azimuthal function is a sine or cosine function where the argument (multiplication function) is multiplied by m. Here, modes for which n=|m| are the only ones which do not contain a lower order term in their analytical expression. The presence of low order terms in the radial polynomial of some high order modes is due to the necessity of ensuring orthogonality with modes of lower radial degree but of identical azimuthal frequency. Of note, every mode is pure in its azimuthal frequency (m). The first 28 Zernike polynomials are displayed in a pyramid where they are ordered vertically by radial degree and horizontally by azimuthal degree. The radial order (n) corresponds to the value of the exponent of a function which possesses r (the distance to the pupil center) as a variable. The first mode, called “piston”, corresponds to a constant wavefront error, which has no optical effect. Its coefficient quantifies the average value of the wavefront error. The defocus and astigmatism modes correspond to low order modes (n=2); their respective radial parts are pure in r^2 phase error (although the defocus mode has a piston term – due to orthogonality constraints). 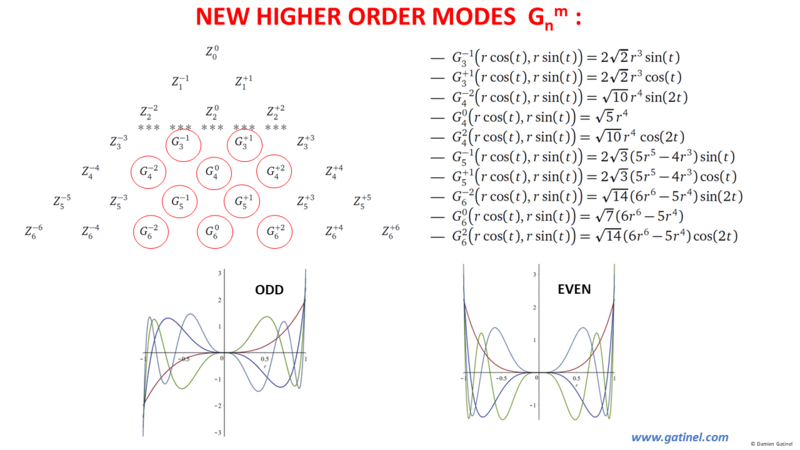 Higher order (HO) modes are defined by a radial order n of 3 and higher. In the left half of the pyramid (m less than or equal to -1), the radial parts are multiplied by a sin(mt) function. In the right part of the pyramid (m equal or greater than to 1), the radial parts are multiplied by a cos(mt) function. When a wavefront decomposition is performed, each mode is given a coefficient value. The higher the value of the coefficient, the higher the « weight » or effect of the considered mode on the total wavefront error. 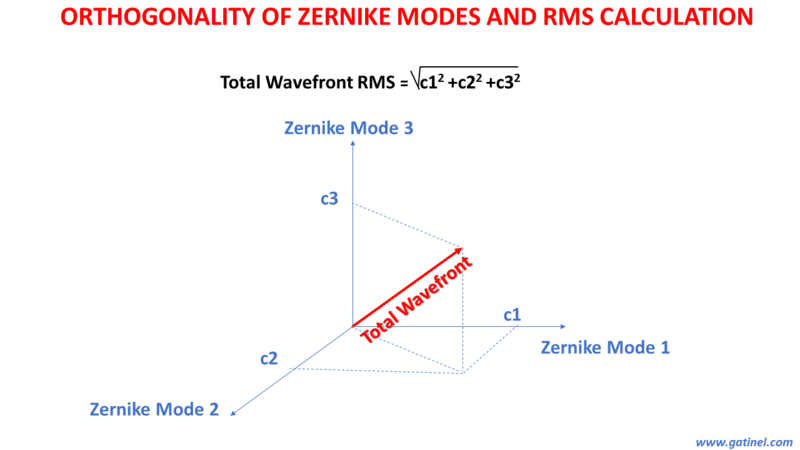 Wavefront reconstruction over a circular pupil can be achieved by adding some Zernike modes, each weighted by a coefficient whose value is specific to the wavefront of interest. – The low degree component of the wavefront should correspond to or be highly correlated with the spectacle correction of the considered eye. 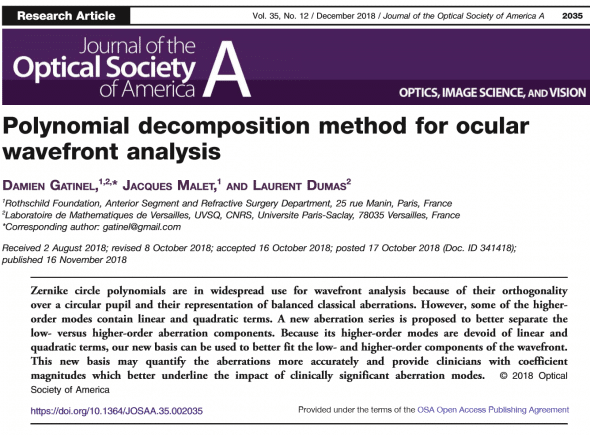 – The higher degree component should predict the residual optical defects that persist after correcting the considered eye with the best spectacles correction. 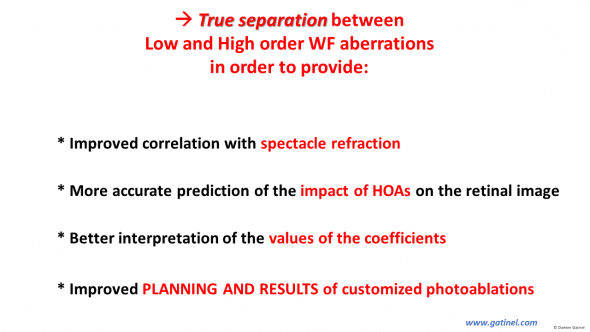 Accurate distinction between lower and higher wavefront components is mandatory to accurately predict spectacle refraction AND accurate retinal image metrics. 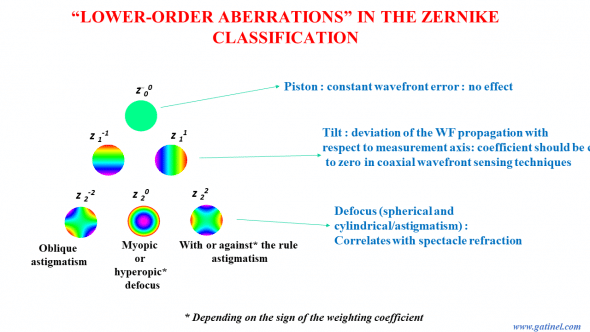 As we will study on this page, the functions currently used for ocular wavefront analysis, called Zernike polynomials, are not suitable to accurately describing the low and high degree aberrations of the human eye. This is due to the fact that some polynomials of higher degree n may contain terms of lower degrees. 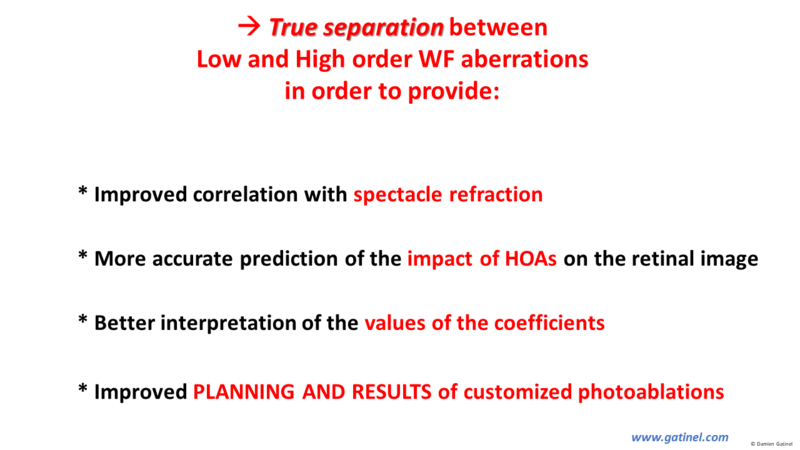 So, the high order aberrations are not purely representing wavefront distortions that cannot be corrected by spectacles. For example, higher order astigmatism contains significant amounts of low order astigmatism. Spherical aberration contains significant amounts of defocus. 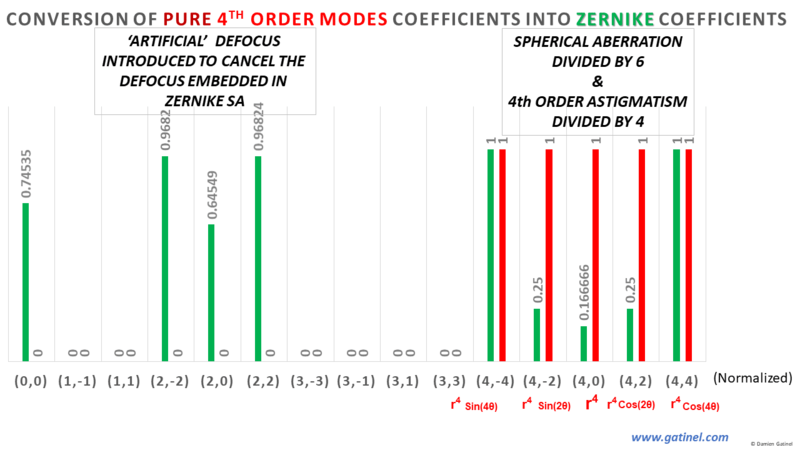 The presence of second-order terms within higher-order modes may explain the discrepancy between the second-order Zernike modes and the best subjective sphero-cylindrical error, and reduce the importance of metrics computed from the higher order wavefront component. 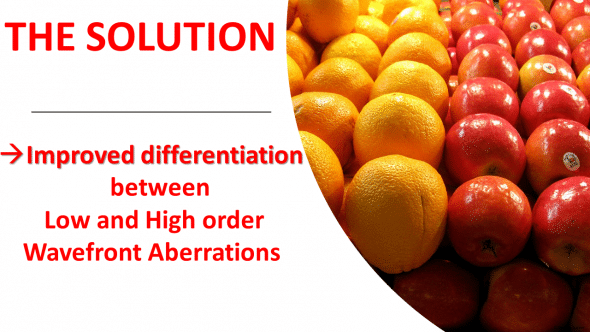 Now, let us focus on the distinction between lower and higher order aberrations. Lower order aberrations are located in the first three rows of the Zernike pyramid. The radial order of piston is 0, the radial order of the tilt modes is 1. The tilt modes should have low coefficients in a coaxially performed wavefront collection when the eye fixation and wavefront sensor’s optical axes are co-linear. Of particular importance are the modes of radial order 2: spherical and cylindrical defocus. In a wavefront decomposition, it is expected that these modes truly reflect and capture the part of the wavefront error which is correctable by spectacles. Myopia causes a wavefront error which is grossly parabolic when viewed in cross-section. Hence, it can be modeled as a function in r^2. Regular astigmatism corresponds to an azimuthal variation of defocus, and the wavefront of an eye where astigmatism dominates exhibits a saddle shape, where the equation is the product between r^2 and cos 2 (or sin 2t), where t is the azimuthal angle of the considered point in polar coordinates. Defocus, being spherical (rotationally symmetrical) or astigmatism (azimuthal), is a pure quadratic phase error (r^2). In cross-section, the phase error can be superimposed onto a quadratic function. Defocus spherical and cylindrical phase error. 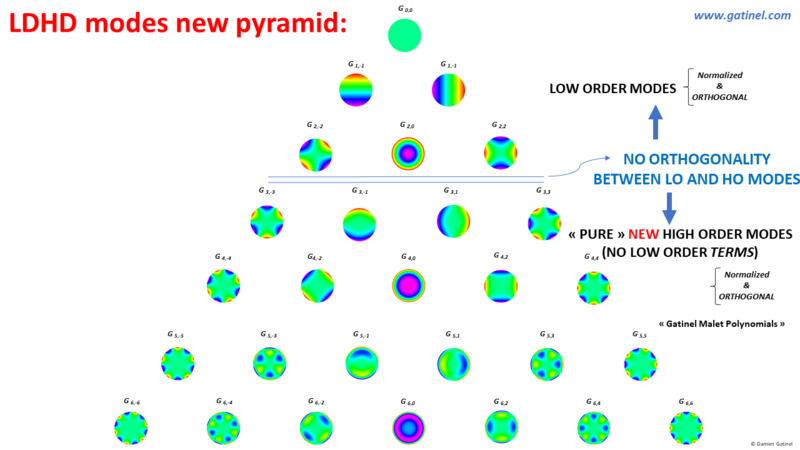 Higher order aberrations are located from the fourth row of the Zernike pyramid and down. 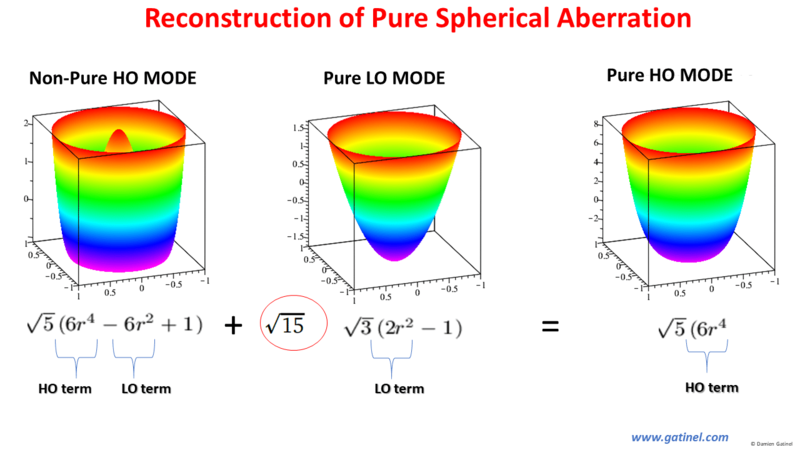 Higher order aberrations should correspond to phase errors which can be modeled with polynomials with a radial degree of 3 (coma), 4 (spherical aberration), and higher. Higher order Zernike modes (coma and spherical aberration). Left: Irregular astigmatism is the hallmark of the optical properties of keratoconic corneas. Along the contour of the keratoconus apex, which is often displaced inferiorly, the distance travelled by the light waves is longer than along the superior contour – This causes the wavefront surface to be distorted asymmetrically. This distortion cannot be corrected by spectacles. The optical effect of such an aberration is to spread the light in a specific direction. 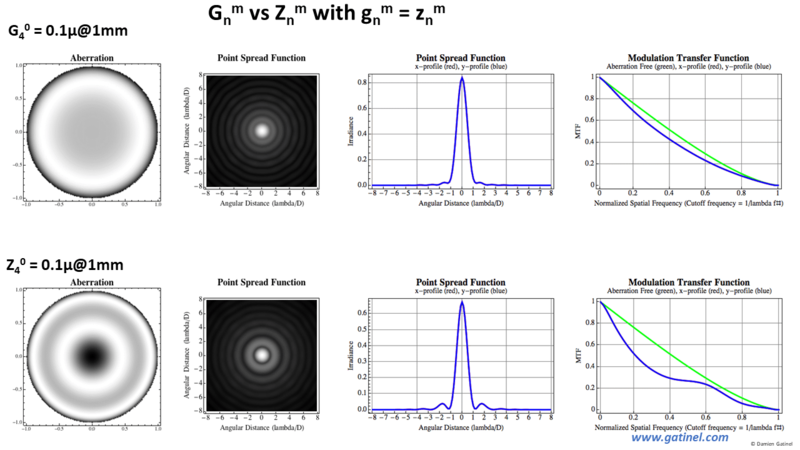 The PSF (Point Spread Function exhibits a « comet » shape. (hence, the term « coma » to depict such aberration which is modelLed by a cubic function). Patients who complain of ghost images or monocular diplopia exhibit increased amounts of coma aberration. 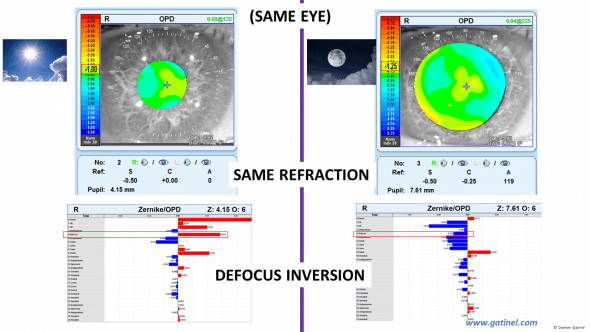 Right: After refractive surgery, patients may complain of halos at night. These are typically caused by spherical aberration. 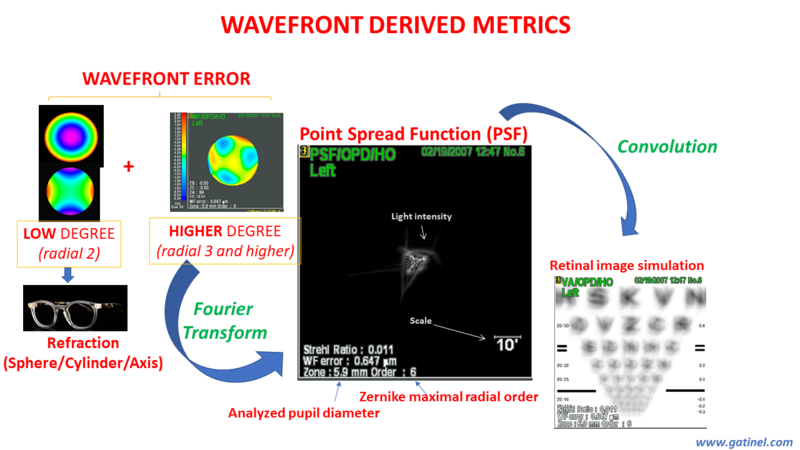 The wavefront error is modeled by a pure r^4 phase error (similar to a Seidel spherical aberration mode) across the pupil. Depending on the sign of the coefficient, the aberration is either positive (typically post myopic LASIK surgery) or negative (post-hyperopic LASIK surgery). A wavefront error can be assimilated into a vector. Because the Zernike modes are orthogonal and normalized (represented here as vectors with a norm length of each vector equal to 1), the wavefront can be decomposed into a base consisting of these « Zernike vectors”. The coefficient of each of these aberrations is equal to the value (length) read on the perpendicular projection. The length of the total wavefront vector (total wavefront RMS) can be calculated using Pythagorean properties, using indifferently all the low or higher order coefficients as all the Zernike vectors are orthogonal! ORTHOGONALITY WAS THE ANSWER BUT… THEN BECAME THE PROBLEM! Orthogonality is an important property which enables the computation of the RMS ( Root Mean Square) values of a specific aberration or a group of aberrations. As stated aboce, as all the Zernike modes are orthogonal, the total RMS of the wavefront (or a group of aberrations) can be computed using « Pythagorean » addition (summing the squared coefficients for each mode, and then taking the square root of that sum). There is an infinite number of Zernike polynomials, but in clinical practice, the wavefront decomposition is limited to modes of higher order equal to 6, comprised of the first 28 Zernike modes, which can be imagined as orthogonal vectors constituting an orthonormal basis in a space with 28 dimensions. 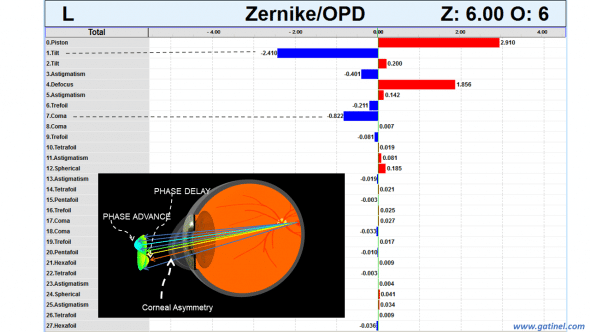 However, there is a price to pay for orthogonality: some of the higher order Zernike modes have lower order terms embedded, and this will be the cause of major issues for human eye wavefront analysis. Classic paper from F. Zernike where his polynomials were defined. The contamination of HO (higher order) modes with LO (low order) terms is the cause of many problems in the domain of ocular wavefront interpretation. As we will see, this has major detrimental consequences on the ability of these modes to predict realistically the visual quality after best spectacles correction, i.e. the true effect of high order aberrations on visual function. Though we repeatedly state that the modes have contamination you can’t see this until unless you look at the actual expression of the polynomials representing the modes. As you can see in the following list of their radial components, the Zernike spherical aberration, as opposed to the Seidel spherical aberration, contains a defocus term, and the Zernike coma aberration contains a tilt term. Zernike secondary astigmatism contains a low order astigmatism term. Hence, the analytical expression of the radial polynomial of some of the higher order Zernike modes reveals that they are not purely constituted of higher order terms. 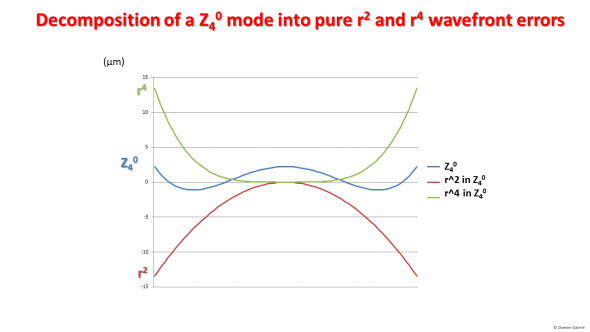 Why is it that some modes are pure in their degree, while others aren’t? The reason for this mixture of high and low order terms is the need to ensure orthogonality within the polynomials of the same azimuthal frequency (same value m). – The orthogonality of the modes of the same radial order n (seen as the horizontal row of the Zernike pyramid) is ensured by the representing trigonometric function since their azimuthal frequency differs. Said differently, the orthogonality of the modes located in the same row is ensured by the variation in azimuthal frequency of sine and cosine functions (which varies from column to column). – The orthogonality of the modes of the same azimuthal frequency m (seen as vertical columns of the Zernike pyramid) has to be ensured by the orthogonality of the radial components within the tensor products (a new vector space formed by interaction between two vectors). 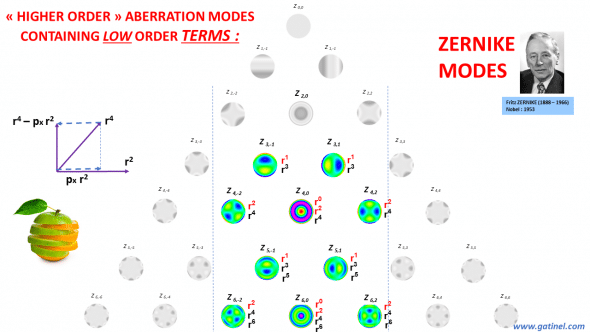 Low order terms in higher order Zernike modes. 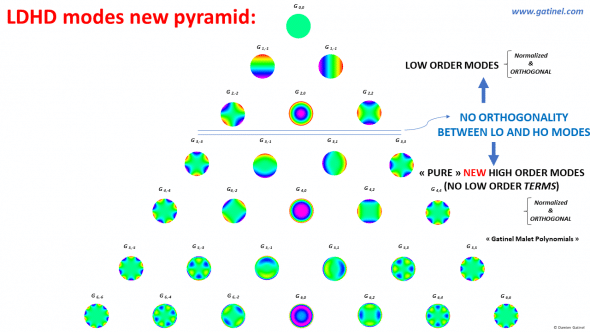 The higher order modes which contain low order terms are highlighted in the Zernike pyramid here. The presence of these « parasitic» terms results from the necessity for all modes located in each column to be « orthogonal ». They are all located directly « below » the low order modes (piston, tilt, astigmatism and defocus). Left to the pyramid of the preceeding figure, the schematic vector depiction explains that to make the vector r^4 orthogonal to the vector r^2, one can project vector r^4 onto vector r^2 in terms of length and direction to create the perpendicular vector (Gram Schmidt process). A mode of higher radial power equal to 4 which is now orthogonal to r^2 is obtained, but this mode contains an r^2 term (defocus). Also, note that the new obtained mode depicted as a vector is « shorter » than the pure r^4 (the length or norm of the obtained orthogonal vector is shorter than the original « pure » r^4 vector). This explains that when that vector is normalized, it requires a higher normalizing coefficient than the pure r^4 mode. This higher normalizing coefficient will artificially reduce the coefficient given to the mode (see examples in the next figures). 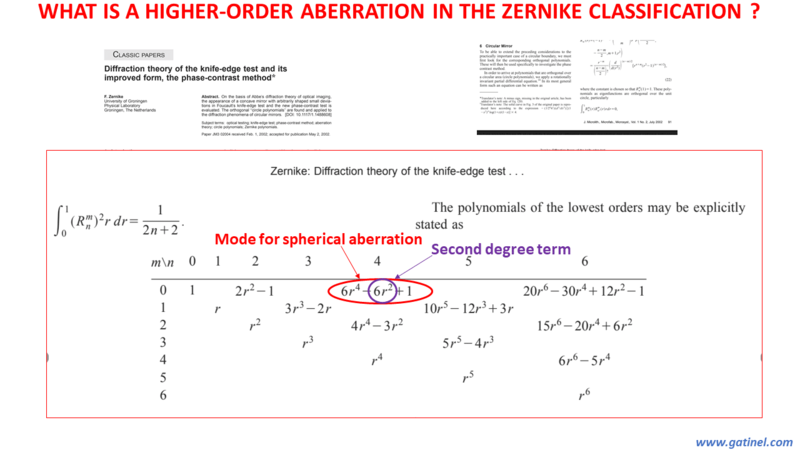 Eventually, the Zernike spherical aberration (Z40) is orthogonal to defocus (Z20) but the price to pay for this independence is paradoxical, as Zernike spherical aberration contains, in terms of weight, equal amounts of r^2 and r^4 terms. We will now examine the effect and consequence of the presence of tilt term in Zernike coma mode, and of the defocus term in the Zernike spherical aberration mode. 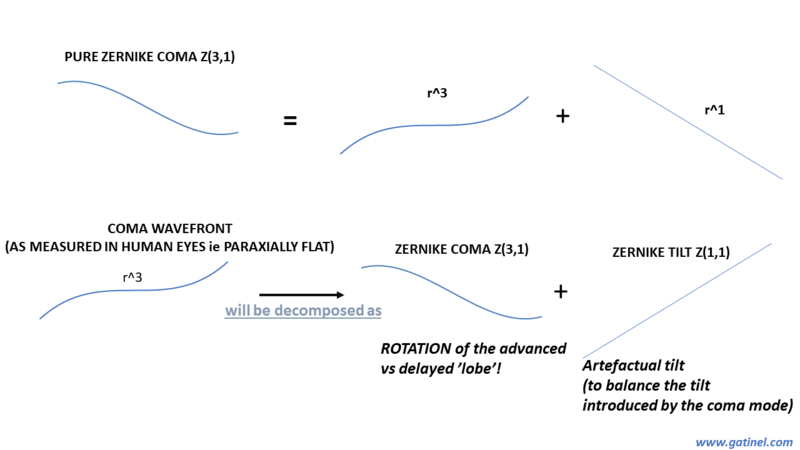 Decomposition of the Zernike coma mode. As opposed to the trefoil mode, the Zernike coma mode contains a tilt term. This graphic depicts a cross-section plot of the phase error of the Zernike coma mode (Z3±1) mode: this phase error is made up of the sum of a term in r^3 and a term in r^1 (so that the Zernike coma mode is orthogonal to the tilt mode). A unit coefficient z31 = 1 micron AND « contains » the equivalent amount of tilt: z11 = 3 microns! The addition of this tilt to the r^3 phase error results in a rotation of the most advanced lobe-like deformation compared to the most delayed lobe-like deformation! It will also cause an artefactual reduction in the RMS of the Zernike coma mode compared to a « pure Seidel-like r^3 » mode by a factor OF 3 !! Zernike coma vs pure wavefront coma. Zernike coma is made of the addition of a cubic and tilt term to satisfy the orthogonality constraints. When a wavefront is collected after emerging from the eye suffering from coma, its central portion is flat (as the eye fixates coaxially along the aberrometer optical axis), and there is no real tilt in the wavefront (the presence of a tilt would reflect the presence of an angle between the eye fixation and the instrument axes). However, the use of a coma Zernike mode to reconstruct such wavefront adds the need for a non-null tilt coefficient, to compensate for the tilt present within the Zernike coma mode. Zernike decomposition of pure wavefront coma. 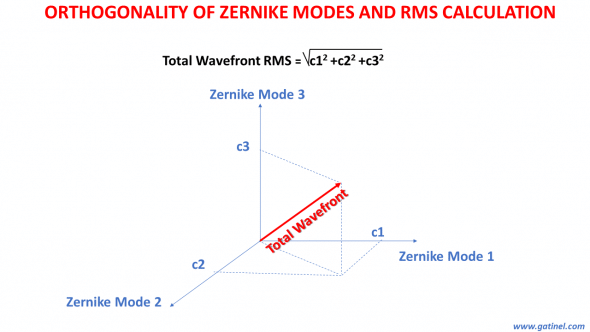 However, he use of a coma Zernike mode to reconstruct such wavefront adds the need for a non-null tilt coefficient, to compensate for the tilt present within the Zernike coma mode. In this theoretical example, we consider a pure cubic wavefront (trefoil and coma-like – without tilt). The functions are normalized (the normalizing coefficients are not shown here). All coefficients are set to 1. Conversion of pure r^3 (cubic) wavefront coefficients into Zernike coefficients. If one expresses this wavefront in Zernike modes, the coefficients of the coma modes are divided by three, and an almost equivalent tilt coefficient is induced by each!! Trefoil is not affected, as in the Zernike classification, it is pure in r^3 (no tilt term). The magnitude of the tilt coefficient coincidentally equals the magnitude of the “true” coma coefficient! Despite the presence of such tilt, the actual wavefront error is paraxially not tilted. These considerations about the reduction of the coma magnitude in the Zernike decompositions have not been clearly made before. 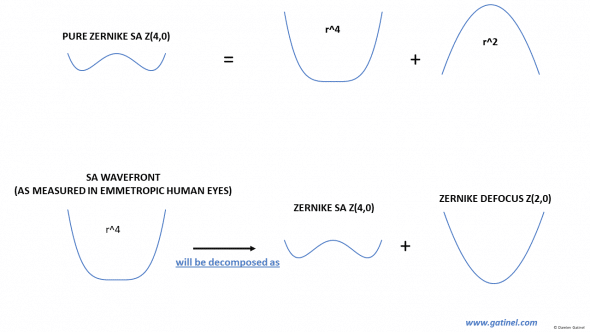 Here is an example of a wavefront decomposition of an eye with keratoconus due to the presence of r^1 terms in the coma modes, artifactual tilt can appear in the Zernike decomposition. This is why, in eyes with increased levels of odd order coefficients such as coma, some concomitant tilt elevation is always observed. This is a problem as wavefront sensing being performed coaxially shouldn’t measure significant tilt. This tilt is an artifact caused by the necessity to cancel the tilt introduced by the coma mode. Tilt aberration in an eye with keratoconus. 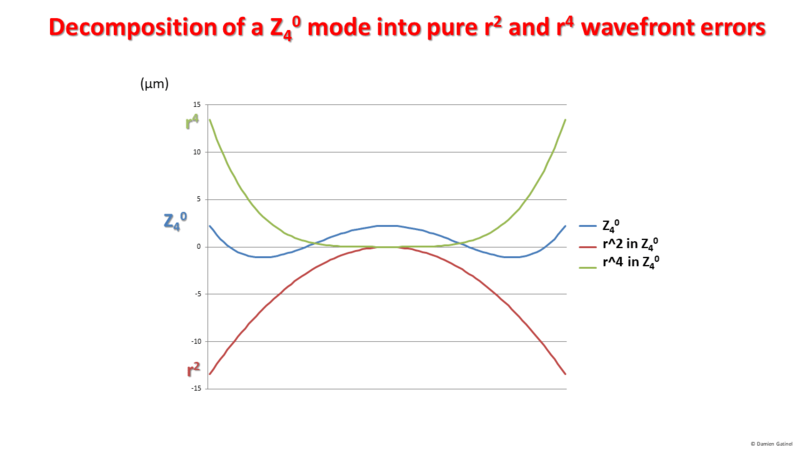 A cross-sectional depiction of the decomposition of a Z40 mode into pure r^2 and r^4 phase errors (equivalent to Seidel modes) is shown. Decomposition of a Z40 mode into its pure constitutive r2 and r4 wavefront errors. –> A unit coefficient z40 = 1 micron « contains » the equivalent of z20 = 3.87 microns! Spherical aberration should specifically refer to an error in r^4 in the wavefront decomposition. In some emmetropic eyes with high levels of spherical aberration (e.g. post LASIK), the central portion of the wavefront is flat. However, the reconstruction of the spherical aberration with a Zernike SA mode will bring some unwanted defocus, which has to be compensated for. Zernike spherical aberration vs pure (e.g. 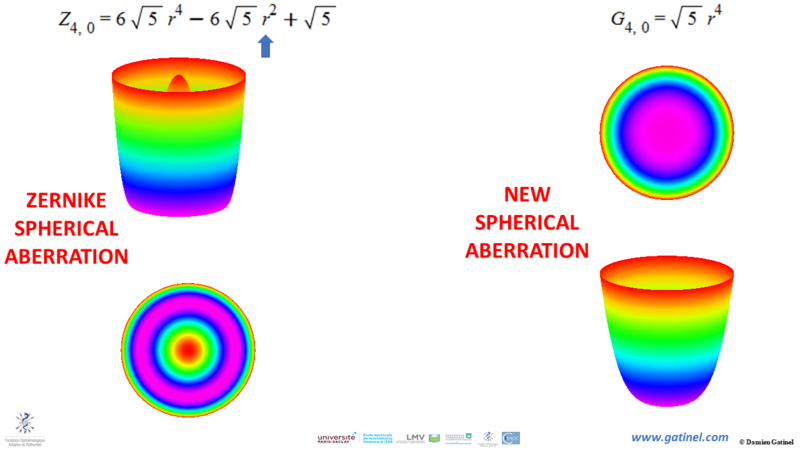 Seidel) spherical aberration. This compensation will, however, appear in the Zernike decomposition as Zernike defocus; the degree of induction of defocus from the Zernike SA will change with the pupil diameter, as can be inferred from the profile of the aberration, in which the central portion is dominated by the influence of the r^2 term. 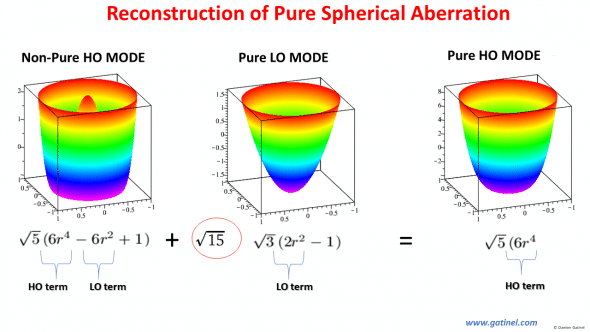 Zernike decomposition of pure wavefront spherical aberration. The presence of defocus in the Zernike spherical aberration mode is very detrimental to the wavefront interpretation. Reconstruction of pure (e.g. Seidel) spherical aberration. For each micron of Zernike SA, 15^0.5 – which is nearly 4 microns of additional defocus is required to cancel the term in r^2, in order to reconstruct a High Order SA mode which is pure in r^4! 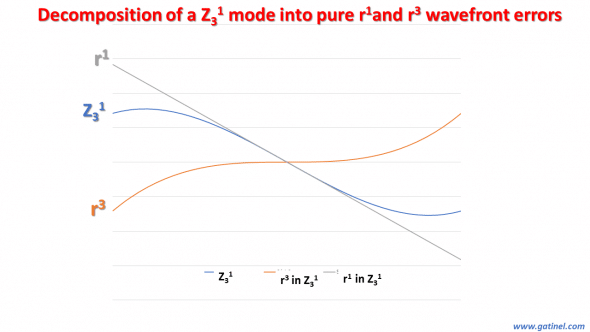 Conversion of pure r^4 wavefront coefficients into Zernike coefficients. As expected, the quadrafoil coefficient is not affected by the Zernike conversion, since it has the same analytical expression in the Zernike classification. 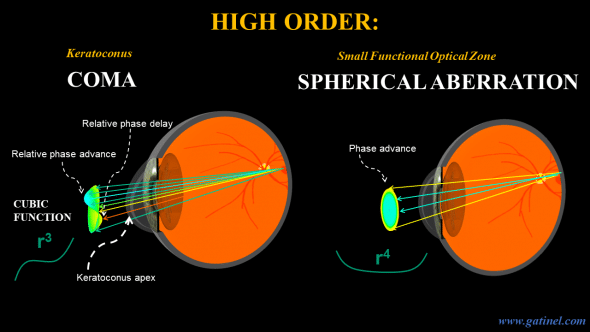 However, the magnitude of the spherical aberration is reduced by 6, and the magnitude of secondary astigmatism is reduced by 4. Artificial defocus as well as astigmatism and piston are introduced. –> 1 micron of Zernike secondary astigmatism contains almost the same amount of second-degree astigmatism! Despite their relevance for the interpretation of the wavefront decomposition, these considerations about the reduction of the magnitude of some HO coefficients in the Zernike decompositions have not been clearly made before. Clinical example: defocus sign inversion with pupil dilation. 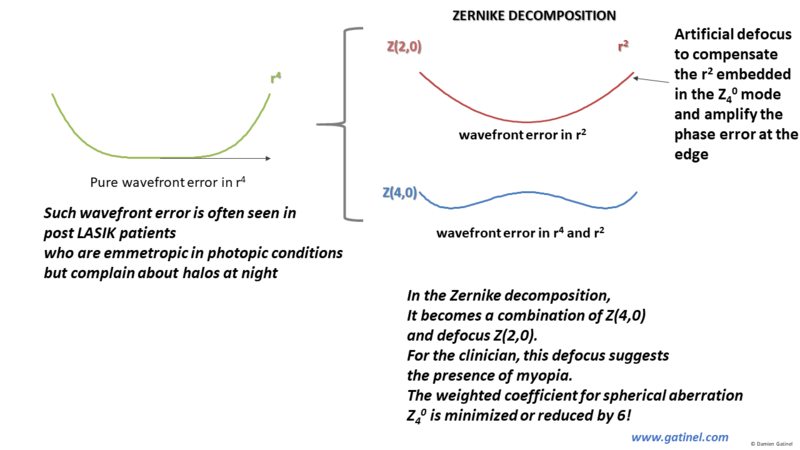 Within the same eye, the Zernike defocus coefficients change their sign between photopic and mesopic conditions (from myopic – positive to hyperopic – negative). 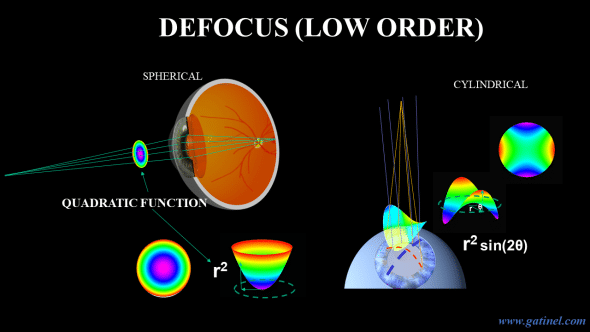 However, the defocus measured through clinical refraction (paraxially dominated) has not changed its sign. However, this confusion is caused by the interplay of within the mode where the positive spherical aberration coefficient increases in mesopic conditions, inducing an artifactual defocus to balance the effect of the r^2 term embedded in the Zernike SA mode. 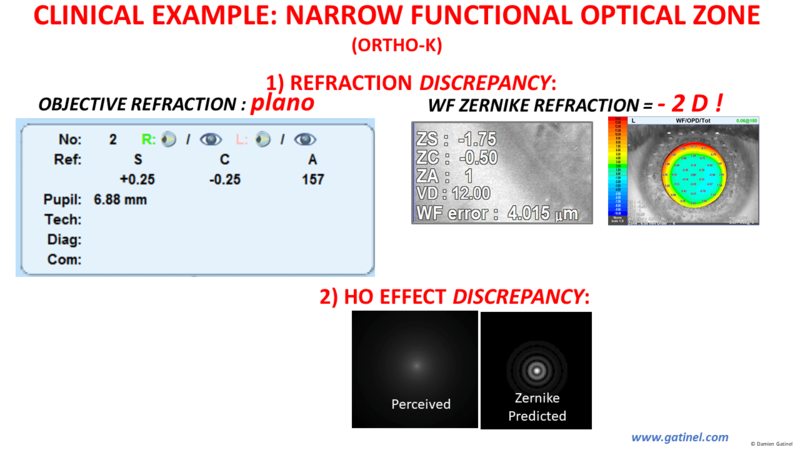 Example of the discrepancy between 1) the objective and predicted Zernike refraction, 2) The perceived vs Zernike predicted retinal image. The « myopic error » of the Zernike predicted refraction derives from the « compensatory defocus » which balances the parasitic defocus of the Zernike spherical aberration term. 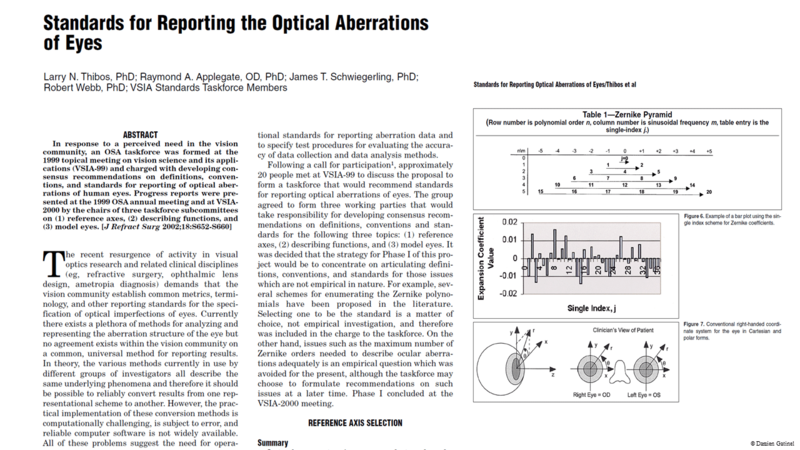 Because of the contamination of some HOA modes by LO terms, the ability of Zernike modes to predict refraction is significantly altered in aberrated eyes. 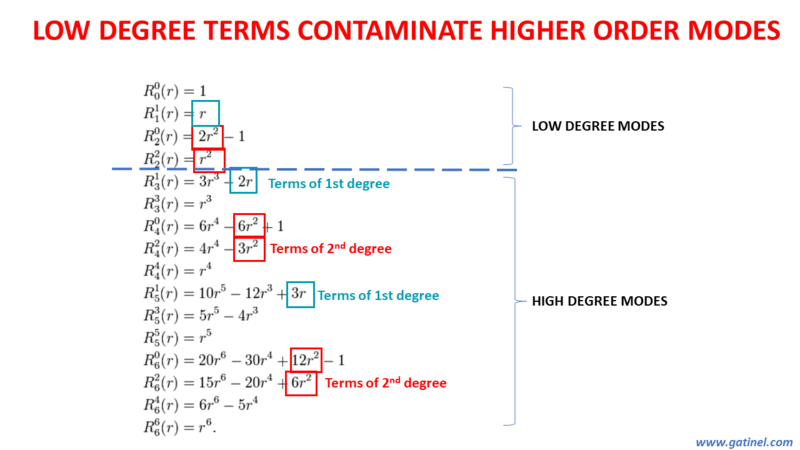 As HO modes contain low order phase errors, some « compensation » in the low order coefficients is expected. Low vs High Zernike split. This will make the low degree coefficients unable to predict refraction accurately. In addition, the calculation of metrics such as HO-PSF or HO-MTF may not be realistic or accurate. These mathematical subtleties explain the discrepancy between automated refraction and Zernike predicted refractions. Also, the HO PSF predicted by Zernike is not realistic, as it is calculated from a mode (Z40) which contains defocus. It should be computed from modes pure in r^4. 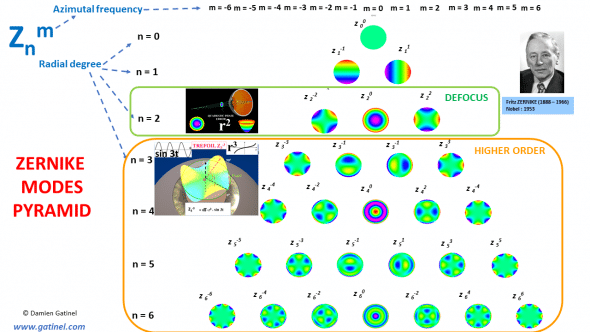 For these same reasons, the reconstruction of the corneal surface using Zernike modes may not lead to an accurate interpretation of the true corneal spherical aberration and apical curvature. –> Zernike polynomials have useful mathematical properties but fail to provide clinically relevant wavefront interpretation and predictions. …… is TRUE and CLINICALLY RELEVANT SEPARATION! However, orthogonality is maintained between the modes comprised in the low order and the high order space. LDHD (Low Degree High Degree) new modes pyramid. The rupture of orthogonality echoes the clinical approach, which « decouples » the low (spectacle corrected) and high order aberrations. It is possible to calculate RMS coefficients of grouped modes within the low and within the high order modes. However, the total wavefront RMS cannot be calculated directly from the low RMS and high RMS values using Pythagorean calculations. Clinicians usually consider the higher order RMS value(s) only and prefer to titrate the low-order component in Diopters unit. Note that the new coma mode has no « central » tilt. The analytical expression of the Zernike mode shows that the presence of tilt results in a 3 times higher normalizing coefficient for the r^3 term (arrow). 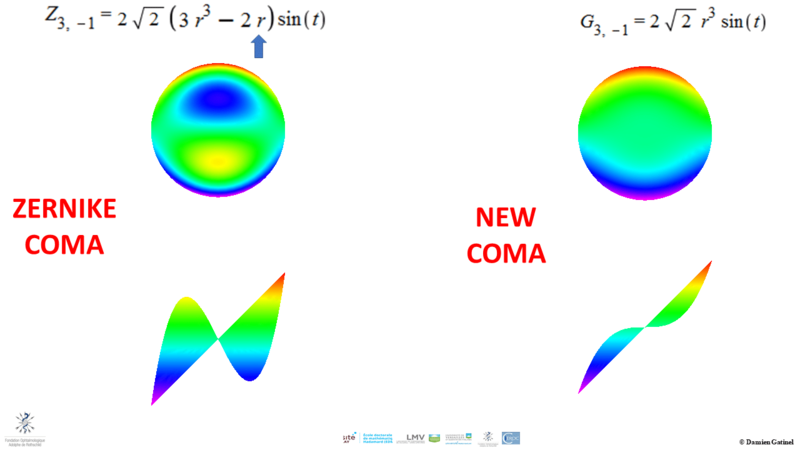 This explains the « artificial » reduction of the coma coefficient by a factor of 3. Note that the new spherical aberration mode is flat in the center. The analytical expression of the Zernike mode shows that the presence of defocus results in a 6 times higher normalizing coefficient for the r^4 term (arrow). This explains the « artificial » reduction by 6 of the SA coefficient. 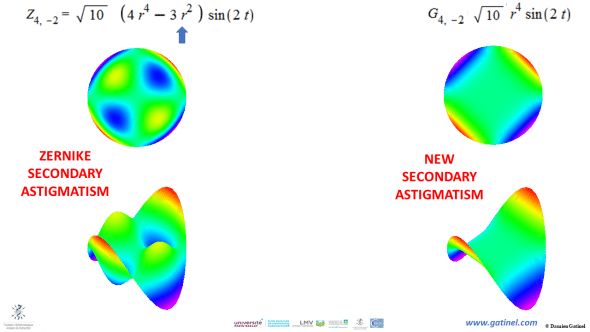 Zernike secondary astigmatism vs new secondary astigmatism. Note the tormented aspect of the higher order Zernike modes (bottom right) which is caused by the presence of lower order astigmatism within their analytical expression (to satisfy the orthogonality property within these modes). The new secondary astigmatism mode is free from lower astigmatism terms. The analytical expression of the Zernike mode shows that the presence of secondary astigmatism results in a 4 times higher normalizing coefficient for the r^4 term (arrow). This explains the « artificial » reduction by 4 of the SA astigmatism coefficient when computed from « pure » (free from lower order astigmatism) higher order astigmatism. – Accurate separation of HOA and LOA. Therefore accurate spectacle correction! – No FALSE compensatory reduction or increase in coefficients. – Accurate assessment of the patients HOA on their visual function. As you can see from the variety of clinical examples above that we propose new mathematical functions which DO NOT incur these drawbacks but keep most of the desirable properties of the Zernike basis. 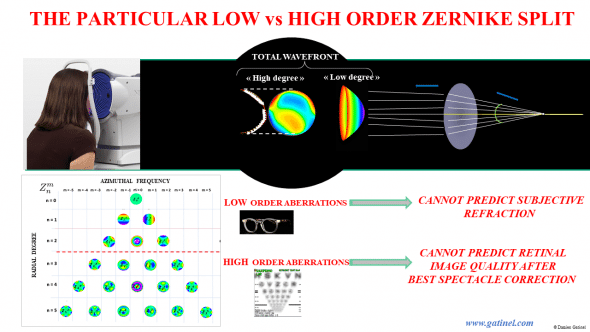 This method should provide a MORE accurate characterization of the low order component of the ocular wavefront, equivalent to what would be obtained through a Seidel decomposition and a BETTER understanding of the impact of higher-order aberrations (HOAs) on visual function. 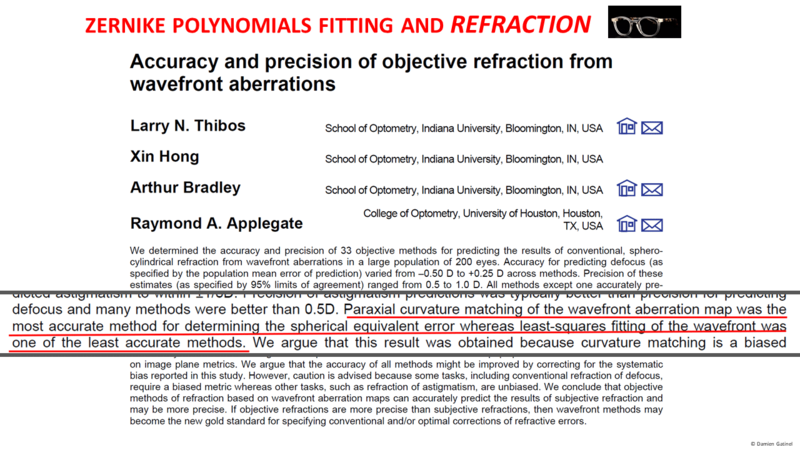 A leap forward for accurate prediction of subjective refraction from wavefront analysis. 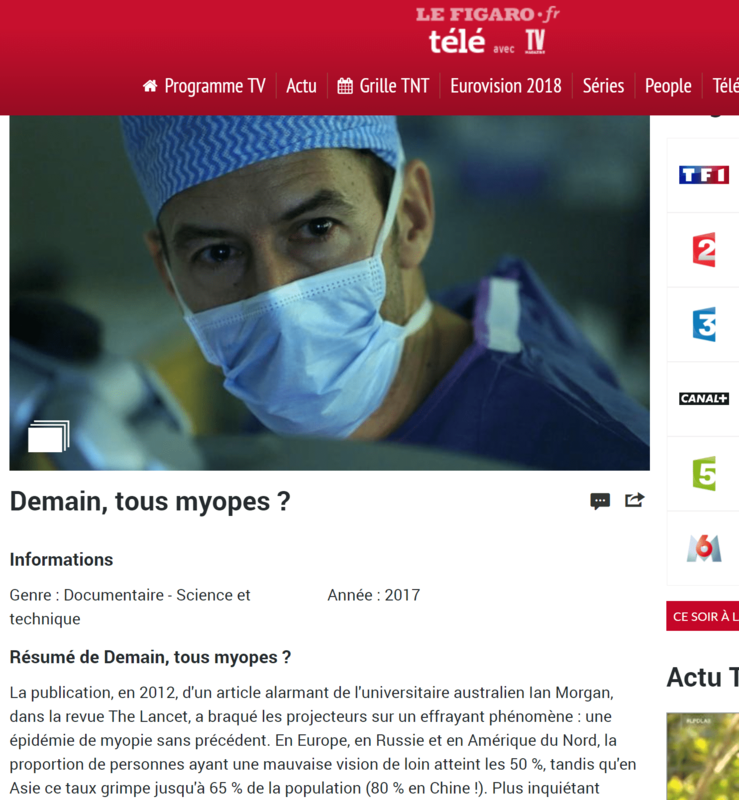 Nice work and explanation, Dr. Gatinel (and the whole team)! I have some questions, but I prefer to ask you directly next time I see you. Thanks Norberto, my pleasure !